Very unusual and should be popular.Is it going to be ic powered or electric also what weight do you expect it to be? 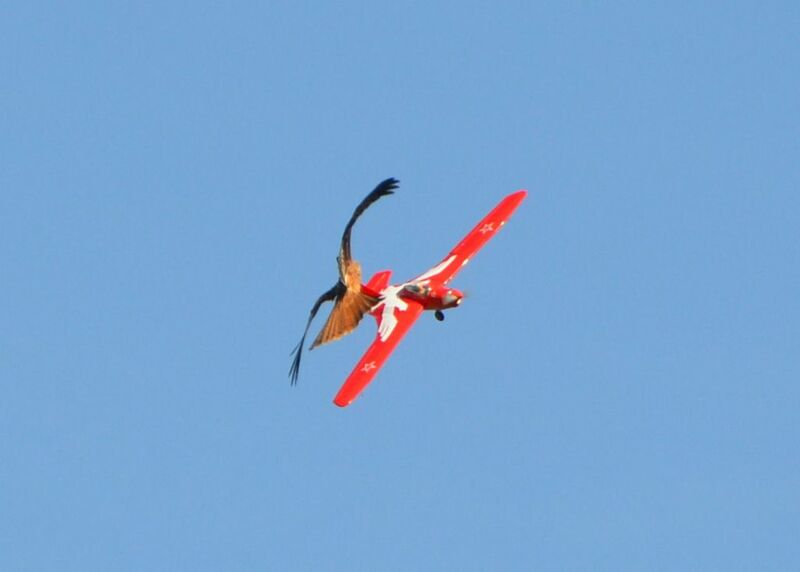 What is the wingspan and will this be coming to RCM@E? It wil be electric powered. Something like a3535 motor, 2200MaH 3 cell battery. I have just been checking the weight and allowig for the final few bits such as cowling and wheel the final weight will be about 2 lbs 12 ounces. Wing Span 72". Wing area is 616 sq in Wing loading aproximately 10 ounces per sq foot. I was highly delighted to find that witha motor and battery in place the CG is spot on. Weather permitting air tests will be next weekend. 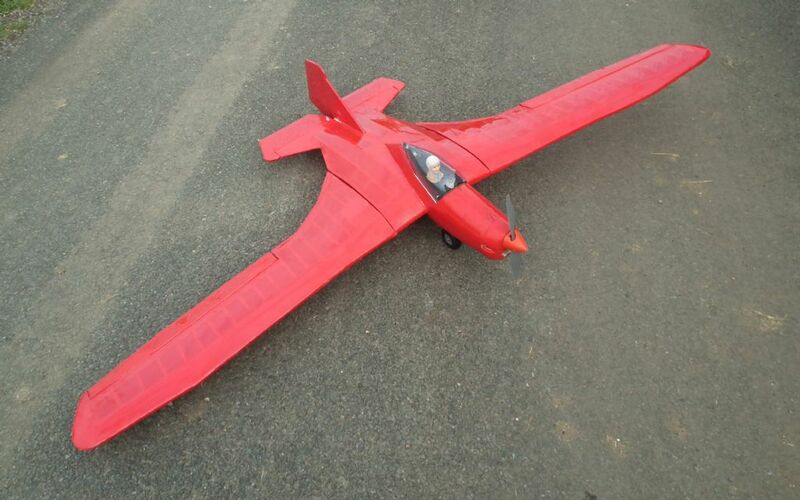 &2", 616 sq inches area, weight 2 lb 12 ounces, Wing loading a bit over 10 ounces per sq. ft.
That looks fantastic! Just the kind of offbeat model I like! Good luck with the flight testing. OK Peter - you win! It looks brilliant. No further progress yet with my version. You obviously have more spare time than I do! In fact, you've almost put me off carrying on with it (but not quite), seeing as yours is so good. Can't wait to see the plan in the Mag. Marvellous Peter! I love the shape - it's so different. 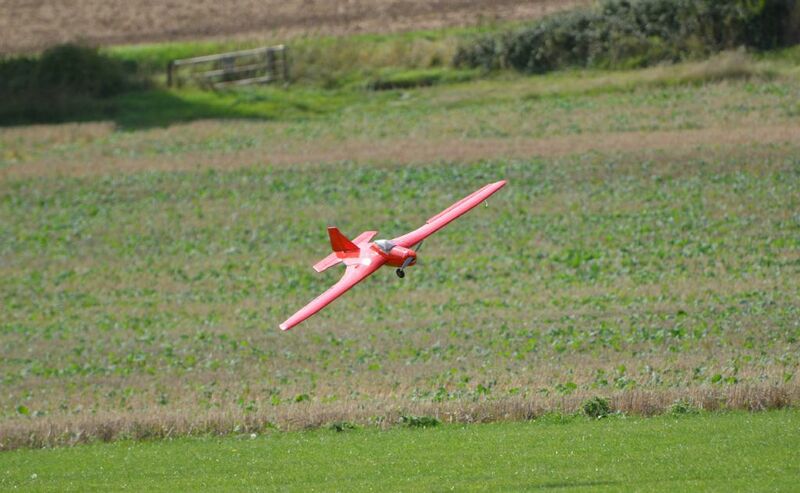 Test flight this weekend? I did get one short test flight. Even though the CG was were it was on my free flight model it was too far back and the elevators were terribly sensitive. I can say that once I went to low rates and cut the throtte I managed to get it down in one piece. Definately wanted my Pampers on!!! Icansay that with a little adjustment It will fly but it may be a while for various reasons. My camera man, Michael did get some pictures and I will post them tomorrow. Here are a couple of the flying shots just to show that it did fly. 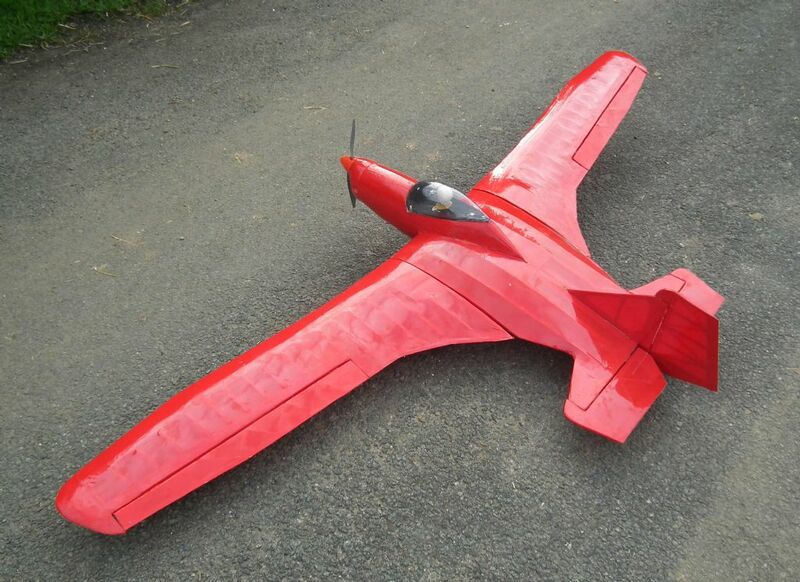 Lovely planform shape of the wing.. Well done Peter. We never doubted that it would fly for a minute Peter . Well done, you are a brave man . Looks like a prehistoric beast airborne, got your ticker beating quicker did it. MAK 15 MP has now been sorted. The Red Kit did not like it!! Another Miller Masterpiece. Well done Peter, brilliant picture. We need another series of articles -Miller Masterclass...…? I didn't take the picture. Fellow club member Michael Morris took it. 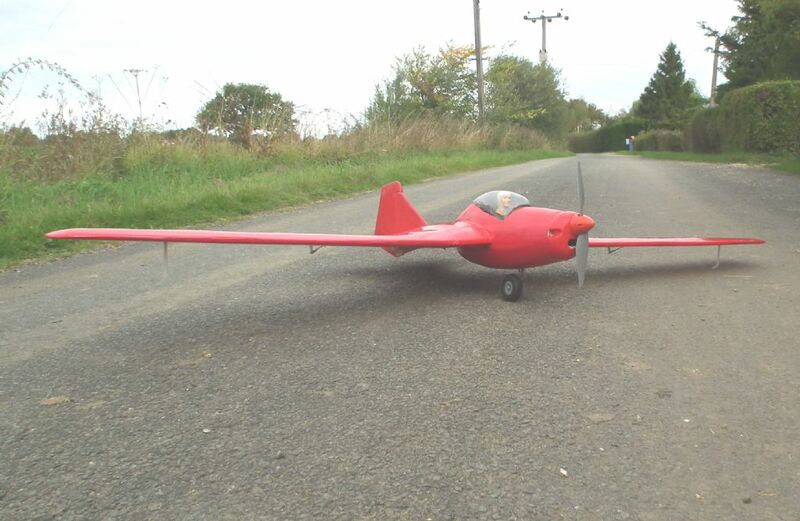 After the first test session which was a bit hairy I moved the CG forward, reduced elevator throws, removed the aileron differential and changed the wing outriggers. 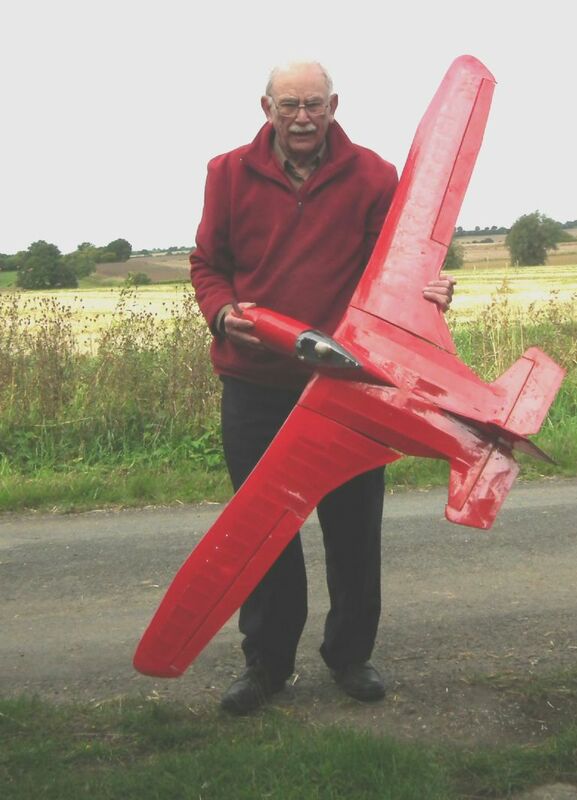 After discussion with Stuart Pickett who flies my models for the camera and the hariest test flights. I am going to move the CG a fraction further forward and add coupled rudder to the ailerons. 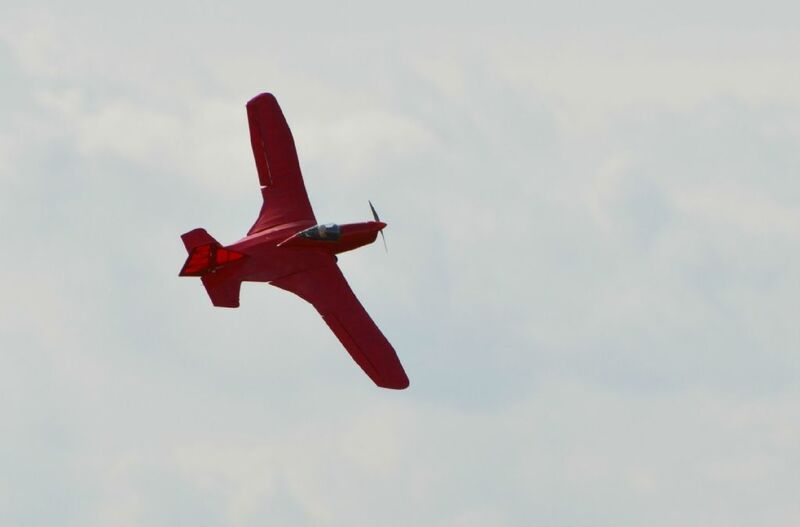 The model will loop and roll and has a very respectable glide. The white on the wings is NON SCALE but I was ordered to do that for better photos in the magazine!!! !